The Most Beautiful Island in Europe? The Maddalena Islands, lying a little off the coast of Sardinia, remind me a lot of the Seychelles - with olive trees instead of palm trees. Prepare yourself for the brightest of sunshine under huge skies and seas of such a brilliant blue they seem unreal. In fact, everything here is so unreal and so spectacularly beautiful that you'll be thanking your lucky stars for being a part of this dreamlike other world– even if only for a short while. Returning home is one of the worst end of holiday experiences you'll ever have. It takes weeks to get over it and to not wish you were back here. Some say it takes forever. Unlike the Costa Smeralda, which is filled to the brim with people and where entertainment runs day and night, you come here to escape the “real” world. You come here to experience the closest thing in the Mediterranean to a Robinson Crusoe experience. 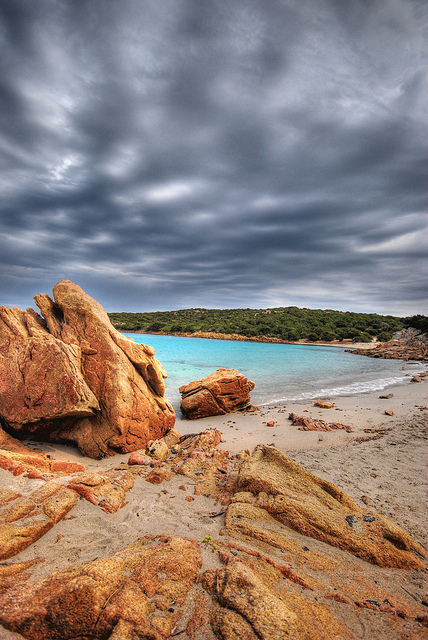 The most famous of all the islands that make up La Maddalena thanks to the famous pink beach of Budell – the Spiaggia Rosa. The pink hue comes from the powdered shells accumulated over millenia and is particularly "pink" early in the morning or early evening. One problem though is that tourists have been stealing pink sand to take home with them and, unless they behave, the beach may be closed to the public in future. I know you wouldn't do such a thing but if you see anyone else filling bottles with sand please tell them to stop or at least give them a dirty look. If the Spiaggia Rosa is closed, which it sometimes is to protect the beach, the nearby Cala Santa Maria on the next-door island of the same name is almost as lovely. You can drive to Caprera from La Maddalena as the two islands are connected by a bridge. It's best to walk or come by mountain bike though as only a few of the beaches can be reached by car. The island is a lot less developed than La Maddalena and because of this I prefer it. I love beaches to be a little on the wild side and many of those on Caprera are just that. Sometimes I've found myself all alone on a perfect beach, with only a few wild goats to keep me company. Photo by Francesco Sgroi - shared under Flickr's Creative Commons License. Take something to eat and plenty of water with you as you can't buy anything on the beaches here. The most famous of the beaches and one of the loveliest is Cala Cotticio. Two other superb ones on the west coast are Cala Serena and Cala Napoletana. Cala Serena is a short walk once you're over the bridge from La Maddalena while Cala Napoletana is about another hour's walk farther north. When you're tired of beaches, although how anyone could ever tire of these beaches is beyond me, you can visit the home of Garibaldi (the famous Italian independence hero). Garibaldi fell in love with this island, purchased it and lived the last years of his life here. You'll see directions to the house on the tarred road that leads from the bridge, right after you cross over from La Maddalena island. Far more isolated than la Maddalena and Caprera, the only way to get here is by boat. Some of the beaches to see include Cala Conneri and Cala Corsara, but there are lots of little ones all over the south and east coasts of the island. Many of these smaller beaches are tucked away in tiny coves and are almost always close to deserted as well as sheltered from the wind. Remember to bring food and drink with you as the island has no facilities. Named after the archipelago itself, this is the biggest and busiest of the islands and it is where you'll arrive if you've taken the boat over from Palau. Big though is relative and you can easily walk pretty much everywhere from Cala Gavetta where the ferry docks. Even the other end of the island is not much more than a ninety minute walk away and walking is truly the best way to explore. You'll be amazed at the stunning beaches and coves awaiting discovery, the more remote and smaller ones are often surprisingly devoid of crowds. If you don't feel like or aren't up to walking there are regular tourist buses that run to the main beach areas of the island. Get on near the port and you can buy tickets on board. You can also bring your car over on the ferry from Palau if you'd prefer to drive. Car rental in Sardinia is a good idea but on La Maddalena it really isn't essential. June and September are the best months as tourist numbers rise a lot in July and August. 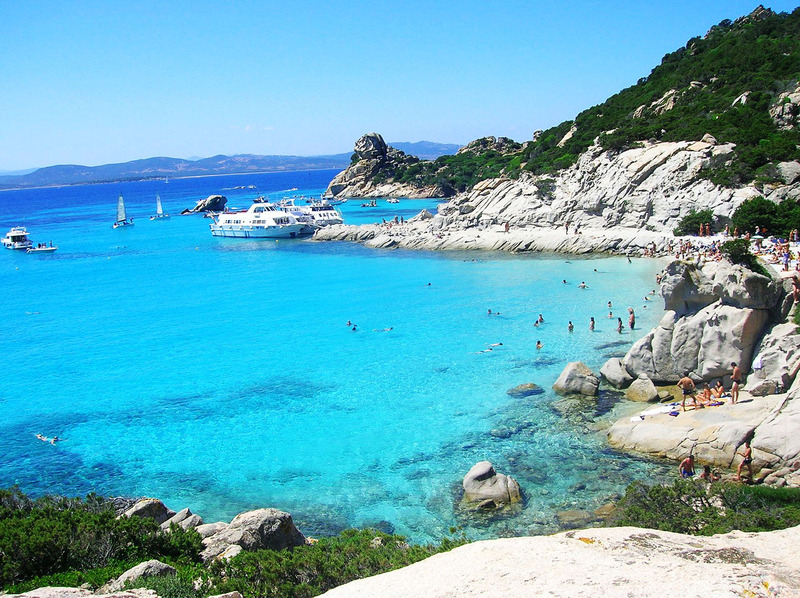 Good news is that numbers aren't anywhere near those of most of the Costa Smeralda and, apart from the beaches near to the port on La Maddalena, you should always be able to find a beach with lots of space for you and your beach towel. Normally we come over on the ferry from Palau which arrives on La Maddalena. Once you've arrived there are a lot of boat trips offered to the other islands and you also have the possibility of renting a small boat (called a Gommone in Italian). If you've never hired one before you'll be amazed at how easy they are to drive (I think that's the word) and you'll be even more amazed at the stunning little coves and deserted bays you'll discover this way. You don't need a license and prices aren't that expensive either. It is well worth the money.